I am a lucky man! My series, “Epic Threats,” just had its second installment published in EN World’s EN5ider Magazine. “Epic Threats” is a series which fills out bestiary ranks with more high challenge rating fifth edition monsters. I’ve found in the upper echelons of the game that there aren’t enough threats to give my PCs the variety of challenges and creature I like, so I made a few of my own, submitted them to EN5ider and they’re being published! You can read my first installment in the series, “Epic Threats: NPCs,” and the second installment, “Epic Threats: Goblinoids and Orcs,” by subscribing to EN5ider for as little as $1 a month through Patreon. 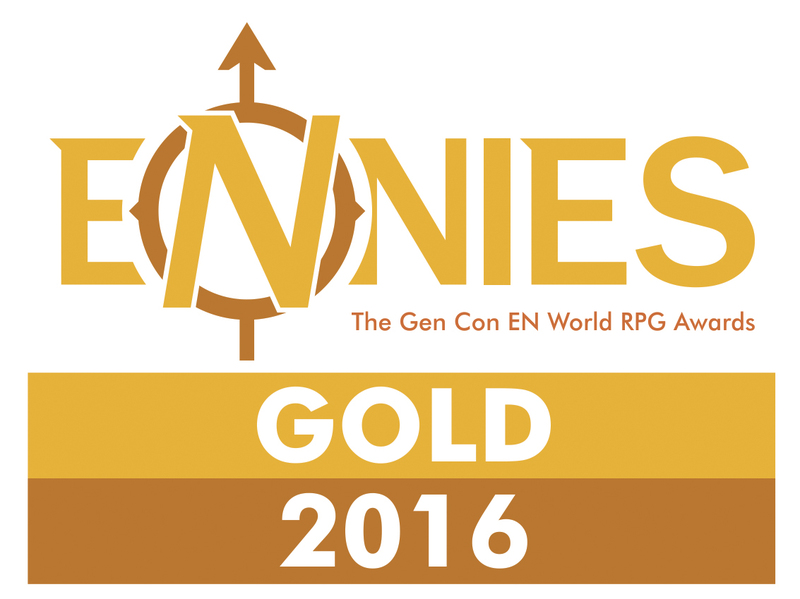 I have to say, if you’re playing fifth edition and craving more content, EN5ider is a great place to get it. I’m not just saying that because I’ve now written for them three times. You get one short adventure a month plus another three articles with advice on running chases, new diseases, new druid circles, creating puzzles, and so much more. You get all that for $2 a month. If you don’t want the adventure, you can still score the articles for $1 a month. That’s less than a bottle of water in most places. The articles are of a great quality and EN World creator, Russ Morrissey, writes several of the best. You can grab some sample articles and an adventure for free so check it out. Whenever I have an article come out in EN5ider I like to write a companion blog post to help promote the article. 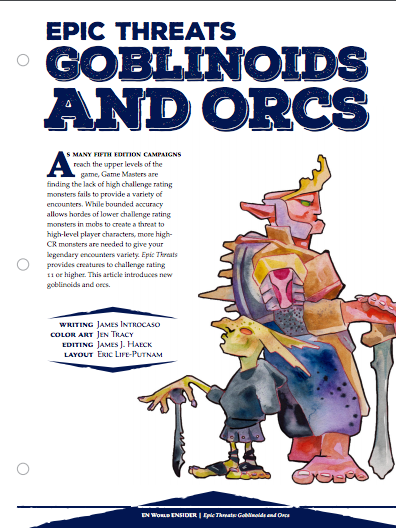 You can checkout the companion piece I wrote for “Epic Threats: NPCs,” “Get Sick,” and, “Give Chase.” Now it’s time to present a companion piece for, “Epic Threats: Goblinoids and Orcs.” The article gives you five new monsters to throw at your PCs, CR 14 – 20. I’m going to show you a CR 12 orc I wrote that I didn’t submit with the article so I could tease you here on the blog. Orc punishers are burning with divine fires inside of them which are fueled by pain. Every piece of steel, arrow, and spell they suffer grows their savage fury until they erupt with radiant energy which sears their hated foes. Aggressive. As a bonus action, the orc can move up to its speed toward a hostile creature that it can see. Charging Advantage. If the orc moves at least 10 feet it has advantage on all attack rolls made before the end of its turn. Eye for an Eye. Whenever the orc takes damage, it gains a number of punishing points equal to the damage taken. These points are cumulative and the orc can have a maximum of 50 punishing points. These points disappear when the orc takes a short rest. When the orc hits a target with a melee attack, it can choose to spend any number of punishing points. The number of points the orc spends equal the number of bonus radiant damage points dealt by the attack. Multiattack. The orc makes four attacks. Greataxe. Melee Weapon Attack: +10 to hit, reach 5 ft., one target. Hit: 12 (1d12 + 6) slashing damage. Javelin. Melee or Ranged Weapon Attack: +10 to hit, reach 5 ft. or range 30/120 ft., one target. Hit: 9 (1d6 + 6) piercing damage. Blinding Burst. The orc spends 20 punishing points and releases a burst of radiant energy in a 20-foot-radius sphere centered on itself. Hostile creatures within the sphere must succeed on a DC 17 Constitution saving throw or take 15 points of radiant damage and become blinded until the end of the orc’s next turn. Allies in the sphere heal 5 hit points. Fey Step. The orc spends 5 punishing points to cast fey step. Would you like this monster in a PDF along with all the other fifth edition D&D baddies I’ve designed? Grab them below. Of course as a bonus this bad boy is elligible to be another submission to this month’s RPG Blog Carnival, which I am hosting here on World Builder Blog. The theme is “Homebrew Holiday Gifts,” and I’m asking bloggers everywhere to share their RPG creations for their favorite systems with me. At the end of the month I’ll make a list linking all participating blog posts so everyone can checkout the fine homebrew creations in one place. When I read Orc Punisher, I was totally hoping for an orc whose family had been killed by adventurers who swore vengeance on them! Now using customized weapons, he hunts down and kills adventurers. Let’s be real. That’s what I wanted to make.